The family-friendly, park-adjacent Hilton at Universal Studios is a modern and chic take on the chain hotel, with two pools, ample green space, and access to tons of dining, drinking, and shopping. This glossy high rise hotel’s main appeal is its proximity to the Universal Studios theme park, but that doesn’t mean the Hilton is skimping on its own amenities. The vibe is decidedly family-friendly, with children’s menus in the cafe and pet-friendly options for when the whole gang comes along. A light-filled lobby boasts plush seating, a cafe and a gift shop, while rooms are clean, simple and stocked with amenities like flat-screen TVs and high-pressure showers. (One downside: unless you’re in Hilton’s rewards program, you do have to pay for internet.) Exactly one block away is the Universal Studios park itself, where rides based off silver screen favorites like Jaws and E.T. lace some real thrills with Hollywood history. (Tip: Indulge your kids at Minion Mayhem, then drag them to Simpsons-themed Springfield for your own enjoyment.) When the lively attractions get overwhelming, relax with a dip in one of the Hilton’s two pools or take a power nap in your supremely comfy, high-thread- count Hilton Serenity Bed. 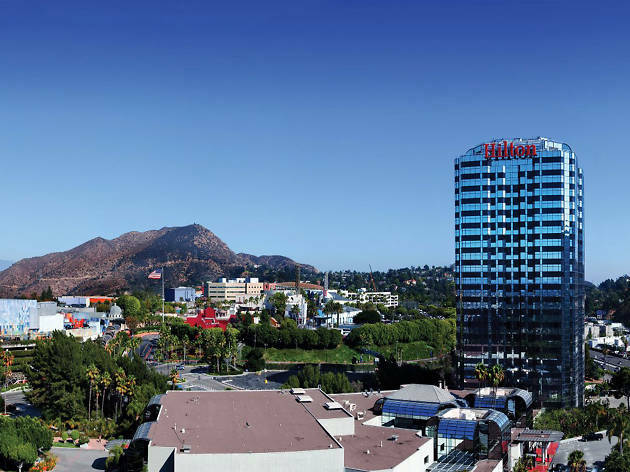 Location: Universal City isn’t exactly known for its artisanal fare; Hot Topic, Bubba Gump and Abercrombie are among the neighborhood haunts. That being said, it’s a boon for kids and teens, who can wander the enclosed promenade while the adults grab a drink nearby. Universal Studios Tour: While it seems obvious that you would book the Hilton to attend Universal’s theme park, take the time to go on the studio’s shuttle tour between more adventurous rides. Narrated by Jimmy Fallon, the tour shows off the famous backlot sets and divulges making-of secrets that will please any movie buff. Wizarding World of Harry Potter: Universal’s J.K. Rowling-approved Potterworld is a delight for fans of all ages and interests; the closest readers will have the most to nerd out on, but there are plenty of rides and attractions for newbies, too. Loteria Grill: Consider leaving Universal Studios for fresh, regional Mexican specialties from this L.A.-based boutique chain. Sushi Yuzu: This under-the- radar sushi spot in the quiet Toluca Lake neighborhood serves up some seriously fresh fish in a no-frills atmosphere. Consider it a welcome respite from the Citywalk’s Hard Rock Cafe. 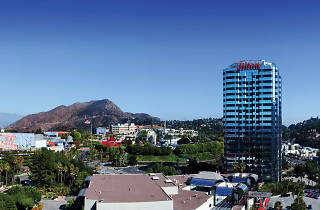 Good for: The Universal Studios Hilton is among the most kid-friendly hotels out there. Bring your family to enjoy the parks, and consider tacking a few extra days onto your trip so that you can tackle the rest of L.A., too. Time Out tip: Check the Hilton and Universal Studios websites before booking, or give the front desk a call—there are tons of seasonal and package discounts to be had for booking rooms and park passes at the same time, and they aren’t always clearly advertised.